“I do apologise, a filthy habit I know, but what can you do?” He raises his eyebrows, stubs out the cigarette (on what looks suspiciously like a rubber plant), and walks across to the table. “I apologise for the inconvenience,” he says, waving an arm languidly around the room, “but we have no better room free at the moment – the Foundation is currently very busy… Allow me to introduce myself, my name is Ushikawa.” He leans across the table, offering his hand to be shaken. You stare at him, unwilling to reciprocate. “Ah, yes, I understand.” He drops his hand and sits down in the chair opposite you. And smiles. A mouthful of uneven, yellowing teeth appear, like a set of dirty dominoes in a worn black box. He continues talking, leaning earnestly across the table. Ushikawa leans forward slowly, spreading his stick-like arms wide in an apparent act of supplication. You nod your head slightly, and then kick yourself for doing so. Ushikawa smiles again, that wide, eery display of the mangled ivory, and nods himself, as if in acknowledgement of a job well done. “I would imagine that another of the issues you may have with the book is one of repetition”, Ushikawa continues. “The two moons, the scene in the classroom…”, he smiles again, almost a leer this time, “even the rather unflattering descriptions of me and my misshapen head… But you see, this is a very long book. I agree, the lengthy speech Tengo gives beside his father’s sick bed, or rather”, he interrupts himself, “a kind of soliloquy, a ponderous recap of all that has happened to him – yes, that may be a little unnecessary…” He pauses and looks you in the eye. “I am quite sure that you, as a very intelligent reader and writer, are in no need of such repetition, but you have to think of others, those who do not read so regularly, or perhaps so quickly. Do you not see a need for a little aid to the memory on occasion?”. “Of course,” he says in a somewhat disconsolate voice, “I can see why you may be offended by certain events in this section of the book, events of a, shall we say, sexual nature?” He glances over at you, raising his large, bushy eyebrows so high that they almost disappear into the mass of hair on the top of his misshapen head. You squirm in your seat and look away, concentrating your gaze on the rubber plant in the corner. Ushikawa smiles and carries on. 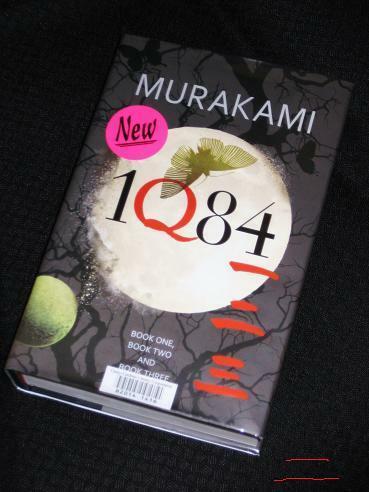 “Whether you are offended with what happens, or just with the clumsy way in which Mr. Murakami expresses it, I can fully understand, but I can assure you that there is a method in his madness…”. You look up, intrigued despite yourself. Ushikawa smirks and says “Yes, I too know a little Shakespeare…”. He winks, and you slouch down in your chair, wishing you were somewhere, anywhere else. He stops, turns to face you and stares deep into your eyes. All traces of his smile are gone; only a tired, time-worn face remains. He waits, staring until, abashed, you have to lower your eyes. He sighs and replies, “Well, if you read Book Three, you may well find out…”. With this, he leaves the room. Great post, one that will probably make more sense once I read the books myself, instead of occasionally glancing at them on the shelves.Glad to see someone else likes playing with their posts. Totally agree, wrote one with my daughter on Dr Suess green eggs & ham in the style of Dr Suess, which we both thoroughly enjoyed doing. So will wait with glee for your next one. I'll suspend my reading until I read the book, otherwise this wouldn't mean a thing to me, yet and because you are not testing if I read this post properly, I can get away by saying it is brilliant anyway! Jeanne – Thanks 🙂 It was a fun one to write! Jo – Absolutely (but please come back later!). Excellent! I really like that kind of review, even if I don't understand everything since I have read the book. But I get that if I read the book I wouldn't understand it either. So all in all, your review gives a good flavour of the book!! Thanks 🙂 Ushikawa is a fascinating character (and a persuasive one! ), so I thought it would be fun to have him defending the novel, especially as many people had a lot of trouble with Book Two. Ah, so “it” happens does it? I was wondering if it would.